Roo is six and Jasper is three. The difference in their ages and genders usually means there's a pretty big discrepancy in the TV shows they like to watch and the books they like to read. One character that we all relate to is Olivia, the pig with plenty of imagination. She's Roo's age (and just as bossy imaginative), plus she has a kid brother Jasper's age, torments the family cat and is just as happy playing pirates as she is playing ballerina. 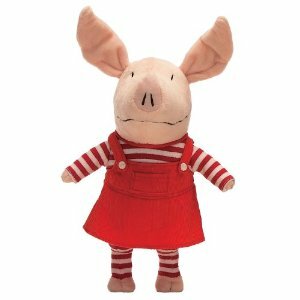 We love the Olivia book series by Ian Falconer and the eponymous Nick Jr cartoon captures the spunky piglet perfectly. Spinmaster has just introduced a fantastic line of Olivia toys and we were thrilled to test them out. 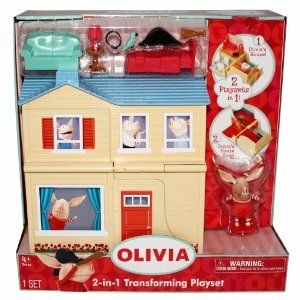 The 2-in-1 Transforming Playset looks just like Olivia's house, with her bedroom, living room and kitchen. But open it up the other way and it's a pirate ship, ready to set sail on the seven seas! The set comes with furniture, an Olivia figure and a bunch of accessories including a parrot and eyepatch. Roo and Jasper both went crazy over this set! I think they had as much fun opening and shutting it as they did playing with the Olivia figure. I wish it came with figures of her whole family but it looks like they are available separately. It seems very sturdy and is also scaled nicely to play other action figures (Polly Pockets and Star Wars were our visitors). You can see the other Spinmaster toy we received in the photo above, a snuggly plush Olivia. She is super duper soft and we all fought over her, but she ended up in Roo's bunk bed. I love her stripey arms and legs and big, floppy ears. This is her everyday look but you can also get her in an opera ballgown, a cow suit and an artist ensemble- complete with palette and beret. So cute! "You really wear me out but I love you anyway." Spinmaster's Olivia toys are available at Toys"R"Us, Target and Kmart stores. Disclosure: We received the toys shown above in order to facilitate this review. We were already big Olivia fans beforehand but would tell you if the toys were subpar. Luckily they are pretty great! They're so cute! I love how one toy can accommodate both kiddos. I haven't gotten into the Olivia series, but I will check it out. How fun is that! I only know Olivia from our TAG reader Olivia book...oh and some Olivia bandaids. But she is one cute piggy.